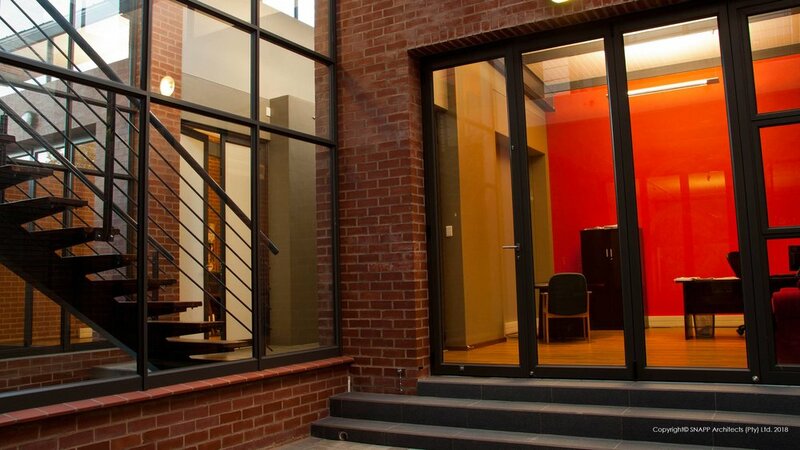 The offices for Matla QS in Hatfield, Pretoria house a well-established quantity surveying firm. The two storey building comprises of four directors’ offices, a boardroom and ablutions on ground floor and staff offices on the first floor. The connection between the two storeys is established through an impressive hardwood timber and steel staircase and the inclusion of a double volume entrance foyer. The building is situated on an East-West longitudinal site, a challenging characteristic in the design of a North facing building.The seemingly problematic orientation is addressed by the introduction of courtyards cleverly placed between the directors’ offices. These courtyards enlarge the effective area of the Northern facade and together with clerestory and corner windows encourage natural ventilation and increase daylighting. The roof design of the offices for Matla QS takes account of a number of challenging factors. The monopitch roof enables the building to reach higher than the building overshadowing the site on its Western side. The large roof overhang provides adequate shade during summer and the use of translucent roof sheeting on Northern overhangs allow light to enter the courtyards whilst keeping heat at bay. The offices are situated on the periphery of a business node next to an established residential area. This residential area is recognized for its old houses characterized by steel roof sheeting. The building responds to both residential and business contexts by making use of the same sheeting, but on an industrial steel roof structure. Visual interest and a reference to human scale is created by a variety of building materials, textures and levels. Quantity surveying plays an important role in the building industry. The use of different construction methods in the building is a showcase of South African construction technology. Different building methods used range from off-shutter concrete to flush-jointed brick laying to exposed steel construction. The offices for Matla QS has not only succeeded in its role to contribute to the creation and implementation of Matla QS as a leading quantity surveyor firm in Pretoria, but also as a testimony to the South African construction industry.